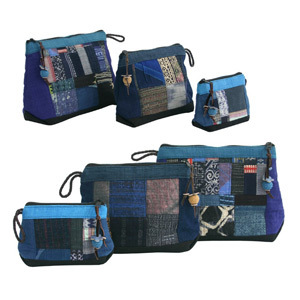 Fully hand-crafted of cotton, this set of cosmetic handbags from Chirada Loetparisanyu features an original hill-tribes patchwork in blue tones. Trimmed with leather, they are ideal to hold cosmetics items. 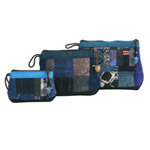 They are fully lined with cotton and close with zippers.